At the time of the IPO, the median Software-as-a-Service (SaaS) company generates $100M in revenue, creates $2.6M in profit and holds $85M in cash on the balance sheet. A company in this position typically raises $107M in its IPO and trades at 11x revenue, for a $1.1B market cap. The path to getting there is revealing. Below is a chart showing the median revenue ramp of the 41 publicly traded SaaS companies by year since founding. 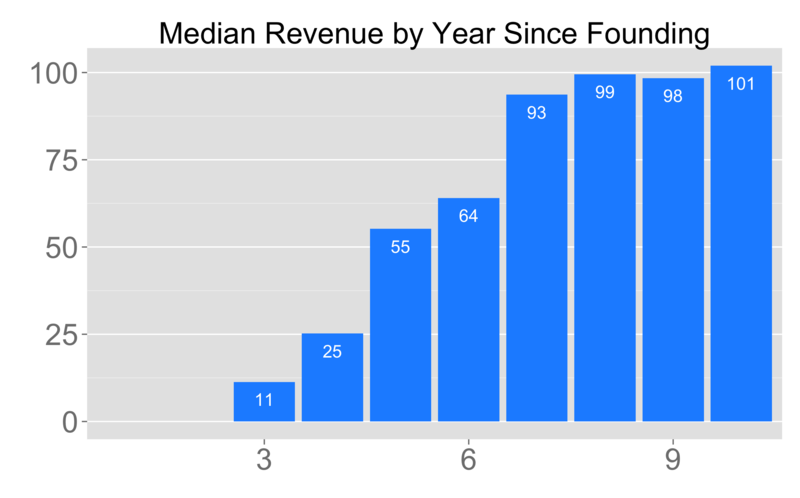 In year 3, the median revenue is $11M. In year 4, the revenue figures more than double to $25M, and then again to $55M. Note, the $11M number in year 3 is somewhat skewed by extraordinarily fast-growing companies. I’ve used data from public filings in this analysis and of the 20 companies profiled with data available in this time frame, only 5 of them (Veeva, Marin, LogMeIn, SuccessFactors, and DealerTrack), grew fast enough to IPO within a time period that would have forced them to disclose their year 3 revenues. By year four, the sample size doubles to nine. To see the trend in greater detail, click here. 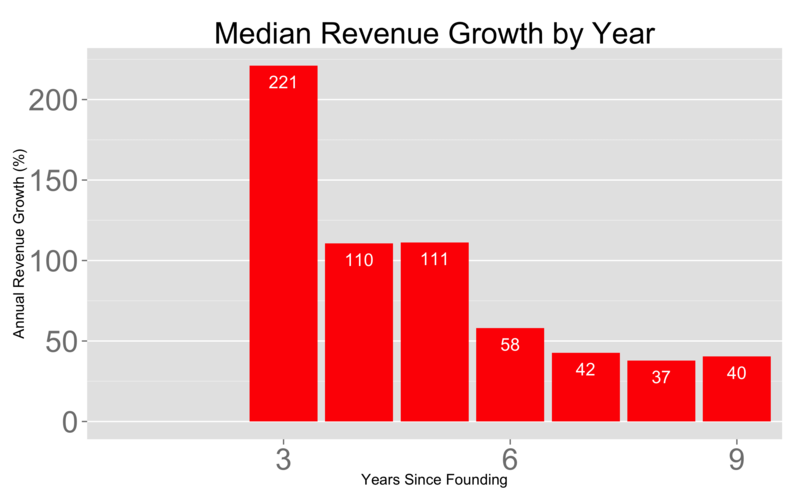 This chart shows the median growth rates of public SaaS companies by year since founding. 220% growth in year 3, and then about 110% growth for the next two years, and then halving once more for the next four years. 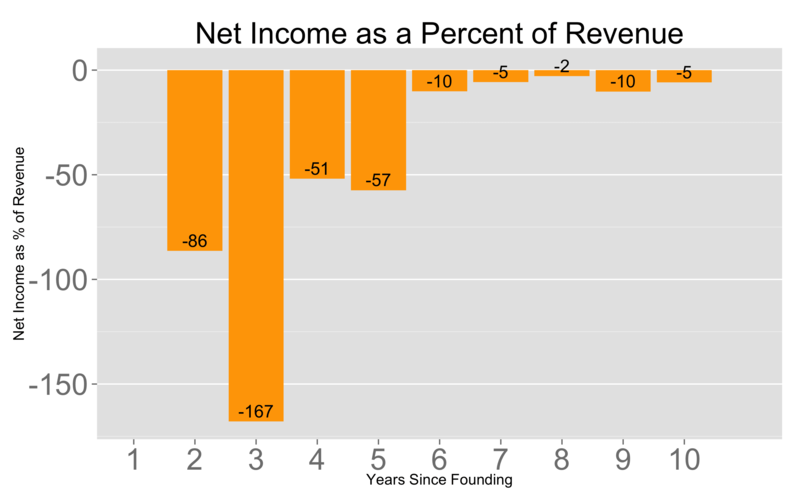 As for profitability, the public SaaS companies in the data set spent 86% of revenue in Year 2, and 167% of revenue in year 3 before falling to the mid-fifties and reaching near-profitability in year 6. Of course, there is a substantial variance hidden within these summary statistics. 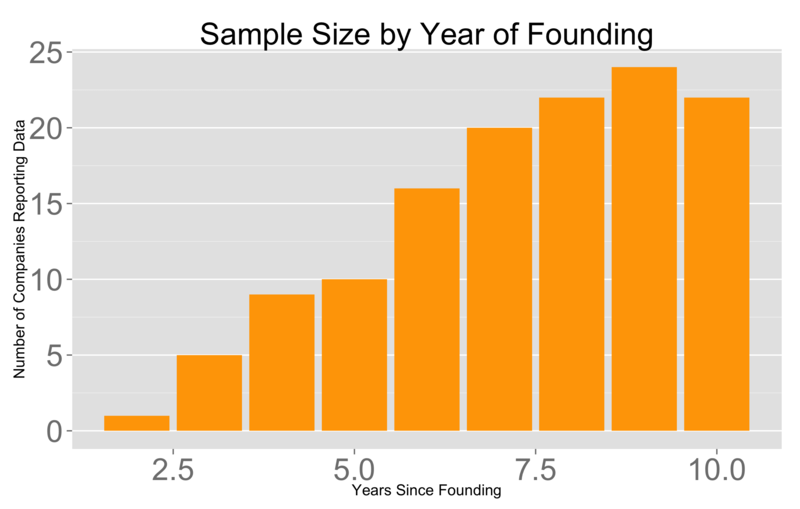 For example, about 1⁄3 of the companies in the data set waited more than ten years to file their S-1s. Two waited 18 years. But the figures do provide a rough sense of the magnitude of revenue and the pace of growth needed to take a SaaS company public.